This product line is called “Miracle II” because its creator ascribed the formulation for these products as the second miracle he received in his life. 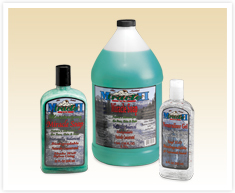 Miracle II is perhaps the most remarkable line of health, hygiene, and cleansing products available today. There are tens of thousands of stories testifying to the amazing results attributed to the use of these soap products. Their unique formulation includes oxygenated water, ash of dedecyl, and calcium, potassium and magnesium in proper and balanced proportion, and excludes any of the harsh or caustic ingredients used in other detergents. Most remedies call for washing with the soap and after drying, applying the neutralizer or gel to the affected area.